We enjoy the challenge that comes with a large print project. 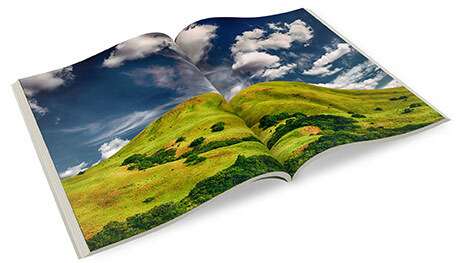 From glossy magazines and catalogs to newsletters and annual reports, InterraMedia can design and manage the layout of your next large document project. We create newsletters, magazines, catalogs and annual reports with modern, clean, professional layouts. We will also insure visual uniformity — all visual elements, such as maps, graphs and photos, will be internally consistent with the rest of the document. There are seemingly a million little details which go into each print project. We are happy to assist you with any number of these, including content writing and custom photography. We will also proofread any content you provide to hunt down any typos while insuring grammatical accuracy. These days, it is important to have your documents available in digital format, for viewing on a website or downloading via email. Thus, in addition to your printed documents, all InterraMedia projects are delivered in digital format for download or online viewing. A great image is the key to making each article jump off the page. We provide professional photography services to accent or complete your content. We even shoot magazine covers. Depending on the size of your magazine or newsletter, your biggest concern might be content. Regardless of your topic or industry, we have the ability to create great content, from a single article to an entire magazine. Designers are known for their attention to detail. For this reason we are great proofreaders. And we are more than happy to proofread and edit your content as we go through the process of laying out your document. Some print projects generate their own revenue. If you are selling ad space in your magazine or newsletter, we provide valuable services for your advertisers, including the design of professional, attention-grabbing print ads. Managing any print project can be a real headache, especially for someone unfamiliar with the processes involved in preparing a document for the printing press. To help streamline the production of your documents, InterraMedia can work directly with the printer of your choice. We are happy to manage all the technical details of preparing your document for print, working with your printer to proof the document, gain necessary approvals, and then see your project all the way through delivery.